The Archetypal Characters found in both blockbusters serve an important function. James Cameron’s latest sci-fi action spectacular has taken quite a few hard knocks in the story department, the predominant being that the characters are far too simplistic. But those same people who so easily cry foul would be shocked to learn that this same issue afflicts one of their most cherished films of all time, Star Wars. The generation of filmmakers who grew up in the 70s and early 80s often cite the original Star Wars as the film that inspired them to choose a career in cinema. To many, this sci-fi flick is beyond reproach, a holy relic untouchable by harsh criticism. Unfortunately, having been affected by this film at such a young age, these sci-fi fans have become blind to the now apparent shortcomings the story has—the same deficiencies they claim Avatar has. Lazy Writing or Archetypal Characters? Let’s get this out of the way right up front. Yes, Avatar is a rehash of Dances With Wolves, Pocahantas and any other story where a colonial white man steps into the shoes of his enemy, more often than not, a poor hopeless Earth-loving native. Using this, however, to argue that Cameron’s film is a victim of lazy writing completely misses the reason why a writer would call upon familiar elements of character and plot. The “It’s just Dances with Wolves in outer space” argument signifies a superficial understanding of the mechanics of story. Avatar had to be predictable character-wise in order for Cameron to fully explore the visual world he created. The more time spent on character development, the less time there is to set up fantastic worlds and visual spectacle. Up In The Air can delve into Ryan Bingham’s (George Clooney’s) personal issues because the world he inhabits is our world. Same with Crazy Heart or The Wrestler. The world of an Avatar, on the other hand, is vastly different. George Lucas understood this in Star Wars. The Wachowski Brothers understood this in The Matrix. And James Cameron understood this in Avatar. Archetypal Characters are a shorthand for writers and filmmakers who want to focus on something more than character development. Characters like these translate seamlessly into any culture and are a quick get for any audience. The farther away characterization moves from the obvious, the harder it is for an author to communicate where his or her characters are coming from. Their motivations are less clear. Why can’t we have both? Why can’t there be awesome spectacle and complex character development? Because the currently accepted feature-film length of two hours simply cannot support it. You might find this in an HBO miniseries, but you won’t be able to find it in your local cinema. Archetypal Characters give an author an opportunity to focus on something other than the characters themselves. Before addressing the characters in both films from an objective standpoint (which is what Archetypal Characters are), it becomes necessary to determine what the goal of each story is. In Star Wars, contrary to popular belief, the goal of the story is not to destroy the Death Star. In more accurate terms, the goal of that story is to fight the Empire. If the Rebels can’t find a way to stand up to them, they’ll be forced to live their lives under tyranny. Thankfully, to the people living in that galaxy far, far away, they succeeded. In Avatar, the goal of the story is to save Pandora from corporate destruction. If the Na’Vi can’t find a way to stop their aggressors, their planet will transform from a vibrant paradise into a desolate mining operation. Archetypal Characters are defined by their motivations in regards to the Story Goal. The Protagonist is motivated to pursue this goal and to consider the pros and cons of achieving that goal. Both Jake Sully in Avatar and Luke Skywalker in Star Wars exemplify this definition and understanding of characters and their relation to plot. In Avatar, the character everyone seems to criticize the most when it comes to being too overly simplistic is Colonel Miles Quaritch (Stephen Lang). Many claim that his motivations are too obvious and that he almost comes off like a cartoon version of an evil Space Marine. But can’t the same be said about Grand Moff Tarkin (Peter Cusing) in Star Wars? From an objective context, both Miles and Moff serve the same dramatic function as the classic Antagonist. Dynamically opposed to the Protagonist, the Antagonist in a story is driven to prevent the goal from being reached, and to get other characters in the story to reconsider their efforts towards achieving that goal. Quaritch’s whole purpose in the story is to destroy Pandora and its natives, and to force Jake to reconsider what team he is playing for. There is nothing else the structure calls for him to do, and thus, he fulfills that role quite adequately. In Star Wars, the Empire, personified by Grand Moff Tarkin (Peter Cushing), does the same exact thing. He works at every turn to prevent Luke and the Rebels from uprising, and takes every chance he can to get them to reconsider their rebellious nature—whether through burning Luke’s Aunt and Uncle or by threatening to destroy Leia’s home world of Alderaan. There is nothing more sophisticated about the Star Wars version than there is about the Avatar version when it comes to the Antagonist. While it might be easy to laugh at Quaritch and his over-the-top Space Marine characterization, Tarkin and his over-the-top Space Nazi characterization provides the same amount of deep thoughtful characterization. They both serve the same dramatic function in their respective stories. This same similarity in character motivation exists between corporate stooge Parker Selfridge (Giovanni Ribisi) and the black knight Darth Vader. Both of these characters fulfill the Archetypal Character role of Contagonist. Contagonist is a dramatic concept unique to the Dramatica theory of story, providing the counterpoint to the more familiar Guardian character. The Contagonist in a story is driven to hinder the goal from being reached, while also providing a source of temptation. 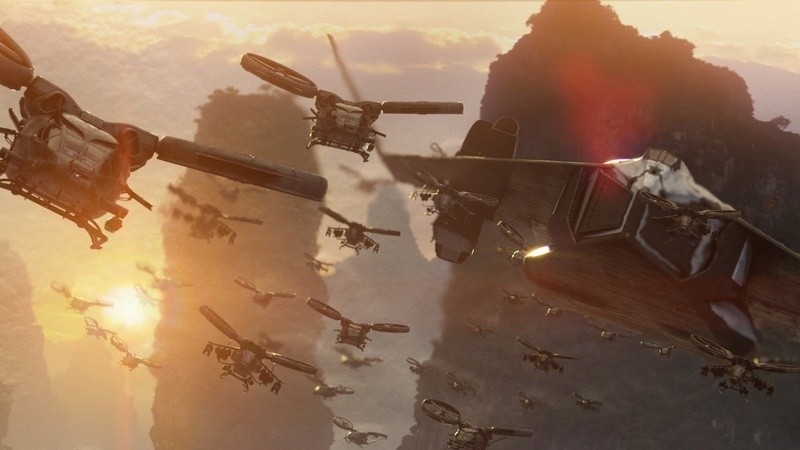 Parker and his obsession with Unobtanium represents corporate greed in Avatar, and thus exemplifies the kind of problems created by someone driven by temptation. In addition, he gets in the way of Jake’s attempts to save the people of Pandora by shutting down the Avatar program and by looking the other way when needed. His character may seem vapid, but the function he is delivering is solid. Many erroneously consider Darth Vader the Antagonist or “Villain” of Star Wars. While on the surface this may seem to be true, it is important to evaluate character motivation in the context of the Story Goal. Darth does nothing to prevent the rebels from fighting the Empire, at least not until the end in the trench scene. Up until then, though, he does an awful lot of hindering—against the Rebels by hiding a homing beacon on the Falcon and even against the Empire itself when he chokes out Upper Management on the Death Star. It is clear, too, that he represents a source of temptation in the story—someone who has given in to the temptations of the Dark Side of the Force. Both Darth and Parker play the same objective character role. There is nothing deeper to them than their desire to hinder and to tempt others off the path towards success. But does Darth receive the same amount of ridicule that Cameron’s Parker sometimes endures? Of course not. That leather-clad baddie with the light sword has become such a part of the collective subconscious that he easily escapes online disparagement. There are other duplicate characters throughout both films. Tsu’tey (Laz Alonzo), Neytiri’s original boyfriend, plays the same Skeptic role that Han Solo (Harrison Ford) assumed in Star Wars. Both were driven by their disbelief, either in Jake’s abilities or in the Force itself. And both were motivated to oppose their respective Protagonist’s efforts. Now, it is true that Han Solo participates in his own sub-story within the greater context of Star Wars, and it is this deeper insight into his character that makes him seem fuller and more well developed than the jealous blue-boyfriend of Avatar. But in the greater context of the main story between Rebels and Empire, there is really nothing more to Han than the guy who speaks out against things and refuses to chip in. Likewise, both Dr. Grace Augustine (Sigourney Weaver) and Ben Kenobi (Alec Guiness) played the same character, that of the Guardian character. In contrast to their opposing Contagonists, both Grace and Ben were driven to help the Protagonist by providing a voice of conscience. As with Han, Ben had a significantly more important role within the overall structure of Star Wars (that of Impact Character), but again, in the context of character motivations in relation to the Story Goal, both are one and the same. Same objective role, same simple character, same dramatic device. Could the storytelling of Avatar been improved? Certainly. But the way a story is told is separate from how a story is structured. Storytelling deals with dialogue and character description. Story structure centers around character motivation and justification. Could the criticism towards the storytelling in Avatar be justified? Possibly. But is there a problem with how simple the character motivations are? Not unless you thought there was a problem with the motivations of the characters in Star Wars. Avatar and Star Wars were populated by the same simple Archetypal Characters. From Antagonist to Contagonist, Skeptic to Guardian, the exploration of character in both films was kept to a minimum as to provide as much screen time as possible for space explosions and Marine hovercraft. If more time had been devoted to character development and complex characterization, the spectacle would have been far less spectacular. In both cases. But spectacle was the purpose of Avatar, as it was for Star Wars some thirty years ago. In 1977, audiences didn’t have access to Twitter, Facebook, story structure blogs(!) or any of the other countless sources of story knowledge we now take for granted. If they did, than perhaps the same level of harsh criticism might have been launched towards that seminal sci-fi action flick. Instead, audiences of the 70s saw that film, loved it, and watched it over and over and over again. They didn’t post snarky videos about how weak the characters were or how similar it was to stories that came before it. They simply watched the film, embraced it and allowed it to become a source of inspiration in their lives. The end result was that filmmaking was changed forever. It is clear now that Avatar will have the same effect on the next generation of filmmakers. Back in December, when the film first premiered, the question was whether or not today’s audiences are too progressive, too well-informed to embrace a story based on Archetypal Characters. Five months later, in spite of all the criticism leveled at the story, the overwhelming positive response to this movie cannot be ignored. Kids (and grown-up kids) today love this film just as much as kids in the 70s loved Star Wars. Among the older generations, Avatar will become the film they love to hate. It will have to be seen whether or not a greater understanding of the mechanics of story structure will somehow allow them to look on Avatar with different eyes. Perhaps then, they can somehow re-capture that spark of imagination they experienced when they first sat down with Skywalker and company.